The historic Nathan P. Howell house is the largest property on renowned Captain's Row and a rare example of period architecture, impeccably renovated to the highest level with original details including the double-hung sash windows, shutters, acanthus leaves, and moldings, expert craftsmanship, fine millwork and trim, antique wide plank floors, and marble mantles. This amazing property is on over an acre, totally landscaped with specimen trees and incredibly unique especially for Sag Harbor Village! 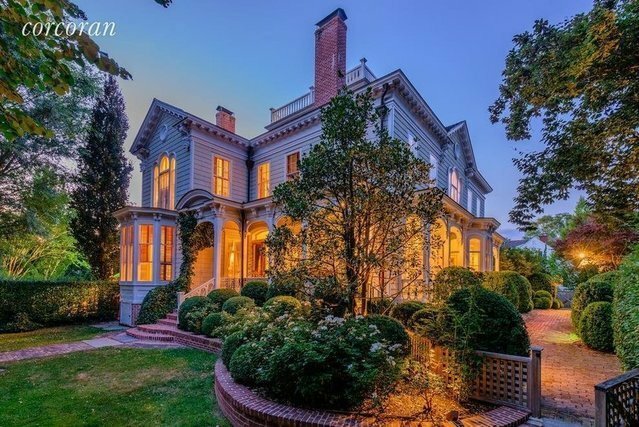 Built in 1833 representing Sag Harbor's most elaborate Greek Revival architecture, expanded and remodeled, the main residence offers over 10,000 sf of living space on four levels with seven bedrooms, eight full and one-half baths. Arched entries lead along gracious hallways to grand light-filled parlors with 10-1/2 ft. ceilings. This stylish landmark home also features a superbly appointed epicurean kitchen, nine fireplaces, two staircases, an elevator, and a cupola. Situated on over an acre in the heart of the village, the elaborately landscaped grounds and beautiful gardens provide the utmost in privacy and include a gunite pool and a four-bay, climate-controlled garage with art studio and full bath attached.